If you’re ever stopping for gas in the town of Mogi das Cruzes in Brazil, you may want to say hello to their cutest employee, a pup named Negão. He works at a small Shell gas station, and while he may not be able to pump gas, he certainly does a great job of putting smiles on the faces of all his customers. Negão was found by Sabrina Plannerer, the owner of the gas station, two years ago. Back then, the gas station was under construction, and Plannerer spotted the black pup wandering around the site. Apparently he had been abandoned there by his former owner and was too scared to leave. Plannerer adopted the dog and made sure he was neutered, vaccinated, and well-cared for. And when the gas station opened, Negão became an employee. The customers love him, and he keeps his fellow employees happy. In return, they give Negão plenty of love and affection, and they always make sure to keep him safe at the workplace. 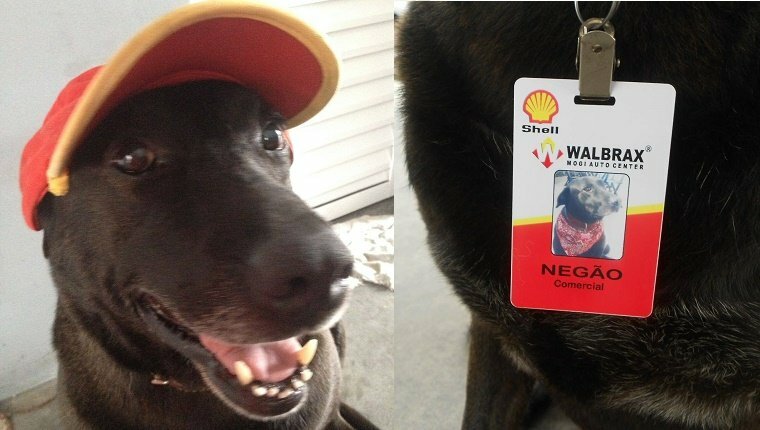 He’s got his own name badge and is the gas station’s official greeter. Negão also helps promote a charity group called Grupo FERA, which works to place stray dogs with businesses like the Shell station when they can’t find more traditional homes. Wouldn’t it be awesome if more businesses had pups like Negão to greet you as you came in? Are you happy to see Negão in his adorable employee outfit? Would you be more likely to visit a gas station with a dog greeter? Let us know in the comments below!